Over the next few months, we’ll be doing a weekly feature on ways to improve your therapy outcomes.These techniques go beyond the core competencies of being a therapist or a counselor and look at more subtle tricks and tools of the trade that we often forget in our day to day efforts to help our clients. As always, we’ll be giving you free practical downloads to illustrate these principles. The first principle we’d like you to look at it is: Consider the client’s learning style. Most evidenced-based therapies stress teaching clients new emotional, cognitive, and behavioral skills. However, none of these therapies take into consideration that clients have different learning styles. Some of your clients are visual learners; others are auditory learners or experiential learners. Some are avid readers and writers; others see any reading or writing assignments as similar to the homework they despised in school. learning sports, or learning to play an instrument, acquiring skills related to their work, or even learning the skills required in a hobby. Asking about your client’s learning history will help you determine how they will most likely learnmental health skills both in-session and between sessions . 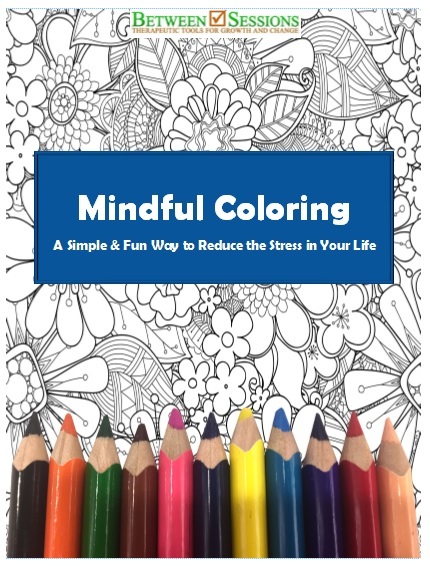 This week’s free download-Mindful Coloring-is an example of thinking about a client’s learning style before teaching a new psychological skill. Mindfulness is a relatively simple concept to explain, but a difficult one for many people to learn. Over the last few years, I couldn’t help but notice the growing popularity of adult coloring books, and I assume their popularity speaks to a common need that many people have for simple activities to involve their minds in our increasingly complex technological world. I also noticed that while many of these books claim to teach relaxation and mindfulness, none that I found had any explanation of how to learn these important life skills. So I created the Mindful Coloring Book with an introduction on how to practice mindfulness. It’s simple to use, and the popularity of this type of tool suggests that it appeals to many people. Of course, if I found out a client was more of an auditory learner, I’d recommend a mindfulness audio, if I thought a client was more physical, I’d recommend combining mindfulness and yoga, and so on. I hope that you (and your clients) find this tool useful. As with all of our downloads, you have permission to use it in any way you see fit for personal or professional use (just not for commercial use), including uploading it to your website.